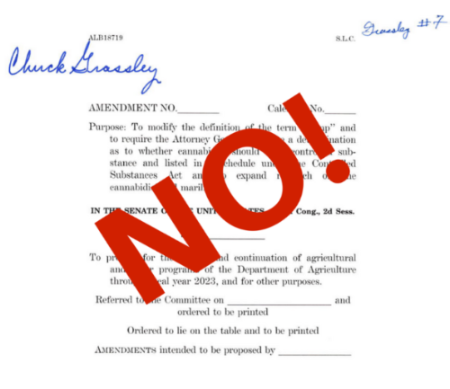 As we reported last night, Sen. Chuck Grassley has filed an amendment to the Farm Bill that, if passed, would devastate our bi-partisan efforts to permanently legalize hemp -- by removing federal legal protections for popular products like hemp-derived cannabidiol (CBD). The Grassley Anti-Hemp Amendment could be considered by the Senate Agriculture Committee as early as this morning. It is critical that we mobilize NOW, and spend the next few hours demonstrating the fallacy of legalizing hemp while banning the very hemp products that are providing exciting economic opportunities for US farmers. Please spend 15 minutes this morning to help us build a political wave to help permanently legalize hemp and stop misguided efforts like the Grassley Anti-Hemp Amendment. Contact Your Senators this Morning: We’ve made it super-easy. Go our online portal, type in your name and zip code, and personalize the message that we have drafted for you. Within a few simple minutes, both of your Senators will get a meaningful email from one of their valued constituents. Tweet to Senator Grassley: Sen. Grassley is a well-known tweeter. Let him know how we feel by RTing and liking this tweet, so that it goes viral. The best-case scenario is that he sees the unpopularity of his amendment and withdraws it. So many Americans complain that there is nothing we can do about our broken political system. Prove them wrong by taking 15 minutes today to make a difference on hemp.